We are a family Circus. 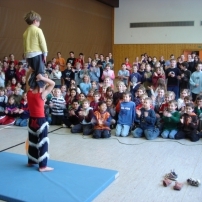 We perform and teach a wide range of circus skills to any age group and any ability. All seven of our children are usually involved in performance with us, which creates shows with a great atmosphere of fun, impromptu moments and inspiration. 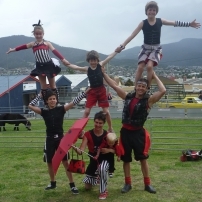 We are especially suited to family and festival audiences however we can also tailor our shows to corporate events. commented on "Come on over! Hobart Relay for Life is this Saturday (23rd), it's a great opportunity to come together to support our loved, and maybe lost ones who are or have battled this horrible sickness. 💞 S"
commented on "A little love goes a long way 😄 Bream Creek show! If you were thinking you wouldn't go it's about time you rethink your options: stay at home bored on a Saturday or Join the fun country side festi"
commented on "Don't forget to smile! 😀 ....or maybe he's stopping his face from sagging in this heat. You'll see this little grub and many more Beatles at the Hamilton show tomorrow (2nd) at 2pm! See you there"
commented on "Late notice I know but come catch us at the Tynwald Park, New Norfolk Relay for Life! This Saturday(23rd) 3:30 - 5:30 Show and workshops!" Late notice I know but come catch us at the Tynwald Park, New Norfolk Relay for Life! This Saturday(23rd) 3:30 - 5:30 Show and workshops! commented on "There's always one.. Anyone headed to bushy park show this Saturday (16th)? We'll be there! Catch our show at 12:30pm. Crazy bikes are always a bit of fun, try one out after the show!" There's always one.. Anyone headed to bushy park show this Saturday (16th)? We'll be there! Catch our show at 12:30pm. Crazy bikes are always a bit of fun, try one out after the show! Keep informed about our upcoming shows and workshops. Call us any time for further information.